Let’s assume I’m evil. What I want to do is INDUCE COMPLIANCE. I want people to do what I want. Well that might be hard to do. But what if I could get people to comply with a request? That may be simple and effective. Dr. Susan Weinschenk wrote a whole book on how to get people to do stuff, but in this case I just want people to comply to a request I make. There’s a paper (of course there is), that’s an oldie but a goodie. It’s entitled “Reciprocal concessions procedure for inducing compliance: The door-in-the-face technique” written by Cialdini, et. al. in 1975. Through a series of experiments the researchers tried to induce people to take a specific action. What was the best way to do that? In the first experiment they asked people if they would work as a voluntary non-paid counselor at the jail, or if they’d volunteer at the zoo. Their goal was to get people to volunteer at the zoo. Working at the jail was the “extreme request”. If you just walk up to someone and say “heyyy come on down to the local jail and work for free”, you’re going to get a lot of no’s. But hanging out at the zoo? That was the small request. They had three conditions. The first was called the rejection-moderation condition. After hearing the experimenter make the first extreme request (jail), which was almost always rejected, the experimenter would then say “oh, no worries, there’s this other program” and make the smaller request (zoo). 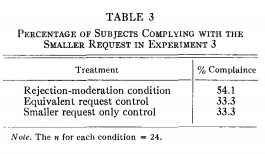 The second control was the exposure control, so the experimenter first described the extreme request (jail) and the small request (zoo), and then requested they do either one. The third was a small request only control, in which, straight forwardly enough, they’d only ask about the zoo. Results? First, no subject agreed to do the jail volunteer. However, compliance with the smaller request varied dramatically. As you can see, they DOUBLED their compliance numbers simply by requesting the jail first. Sounds like a simple framing effect right? The jail feels like a large request, so the zoo feels small. But it’s much more than just framing. The authors of the paper argue that it is only when the second favor can be considered to be a concession that compliance is increased. Next the researchers ran Experiment 2 to test for framing. This time the participant was approached by two experimenters. Sneakily a third then came up talking about an upcoming exam (the research was done on a college campus). Again, there were three conditions. The first was the rejection-moderation condition. In this condition participants heard the first experimenter ask for the extreme favor, and then ask for the second smaller one; the same as in Experiment 1. The second condition was the two-requester control. This was the same as the first condition (rejection-moderation) but this time upon refusal of the extreme request, the first experimenter thanked the participant and walked away. The sneaky third experimenter that had come up later then would make the smaller request. If it really was framing, if just being exposed to the more extreme request framed the participants in a way that made the zoo feel better, than this should work as well as the first condition. 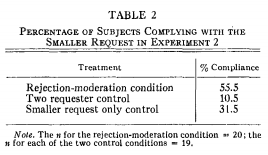 The third was the smaller request-only control; the same as in Experiment 1. Fascinatingly, when the request was asked by a different person there was very poor compliance rates. In order for the “magic” to work, the smaller request must be made by the same person who made the larger (rejected) request. It wasn’t framing. Exposing the participants to the two different requests had no effect, or even backfired. It is much more about feeling bad about turning someone down, and wanting to give them a concession. On to the last experiment, Experiment 3. The researchers were looking to disprove that it’s simply persistence that is the cause of the persuasion. In theory, maybe the reason people are breaking down is just the constant asking. Experiment 3 was set up the same as Experiment 1. The participants were put in three conditions. The first was rejection-moderation, again. After hearing and rejecting an extreme request, the participant then heard the same person make a smaller request. This worked well in Experiment 1. The second control was an equivalent request. The participant heard a requester initially request for them to be a chaperone (small request), then request to do the zoo (small request). If the higher compliance rates were due to pure persistence, aka wearing people down by bugging them, then a high percentage of people would agree to the second small zoo request after being asked to chaperone. The last condition was the smaller request only control that was the same as before (only asking if people would go to the zoo). Asking for a smaller favor first, and then coming in again had no effect over the control. It made no difference. It was NOT simple persistence. It was the rejection followed by concession that made people feel indebted to someone. Rejection then concession is the magic secret. If you want to get people to comply to your request, you need to have people reject you and feel bad. You can exploit their guilty feelings to ask a smaller favor that they are more likely to accept out of guilt. That’s why the researchers call it the reciprocal concession model. Both parties make a concession in reciprocity to each other. So again. If you’re evil and you want people to COMPLY WITH YOUR REQUEST, follow these steps. That’s how you drive behavior and compliance. You use norms and feelings of “owing” something to another person. Ironically compliance is driven best through empathy and compassion. Of course, things get interesting when your compliance request is to harm others, or not prevent harm to others. When people think of compliance I think it is inevitable to think towards dystopian futures and the Nazis and standing up for what you believe in. That compassion can drive compliance behavior is interesting. But remember it’s not compassion towards a third party that gets results. It has to be compassion towards whomever is making the request. Try the steps! See if you get better results and let me know. A quick caveat about this study. It was done a while ago, probably with only white college students. It is possible that results may vary between societies. Otherwise I bet it works! Now give me $10000 of work. No? How about $1? You owe me. Paypal guthrie@theteamw.com 😊 thanks.